The featherweight paddle jacket with sealed seams, adjustable splash cuffs and collar and neoprene waistband complete this GORE-TEX® version of our classic paddling jacket. The zippered sleeve pocket with reflective piping is self-draining and accessible while wearing your life vest. Adjustable coated Lycra® collar keeps splash out. See Kokatat's Men's/Unisex size chart. Solent Long Sleeve Hybrid waterproof breathable paddling jacket by LEVEL SIX. The Solent introduces a new paddling jacket option for SUP and recreational kayakers. 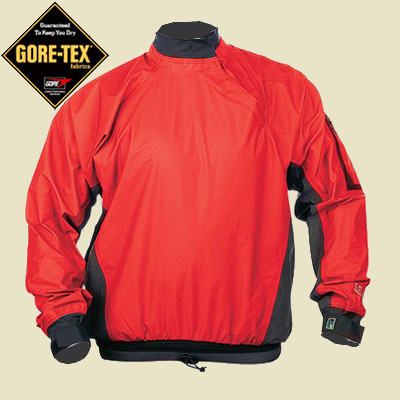 This jacket offers outstanding protection and comfort at very modest price. The Solent features our unique zipper collar opening with a fleece lining, a recessed chest pocket and comfortable neoprene wrist gaskets. The Solent features our eXhaust 2.0 fabric for great waterproof breathable performance that will not break the bank. Sizes; small 34-36", medium 38-40", large 42-44", extra large 46-48", xxl 48-50". The Rapidstyle Microvent Extreme is made with Xalt material - Xtreme Allweather Laminate Technology. A high tech composite system that combines innovative fabric and laminate techonolgy for superior waterproof, breathable, windproof comfort and protection. Item is new but old inventory, reduced price for Quick Sale. The arm, neck and waist closures are comfortable and adjustable. Urethane coated, rip-stop, lightweight supple fabric. Non-taped seams. 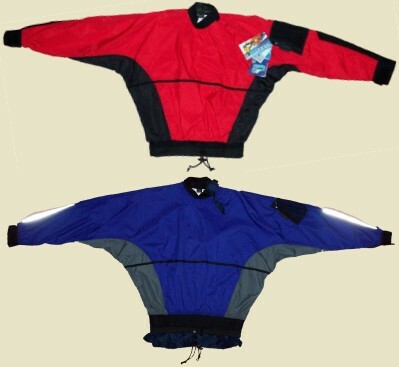 Adjustable neck and arms with Neoprene/Velcro� closure. Drawstring waist and mesh pocket on chest. Item is new but old inventory, reduced price for As Is SALE. Long sleeve top for paddlers made from a high performance waterproof/breathable fabric. The adjustable Neoprene/Velcro wrist and neck closures, combined with a base layer offers good exposure protection and all day comfort. Excellent all-around protection from UV, wind, rain, spray and partial immersion . Seams are waterproof and the wrist, neck and waist gaskets are comfortable and adjustable. 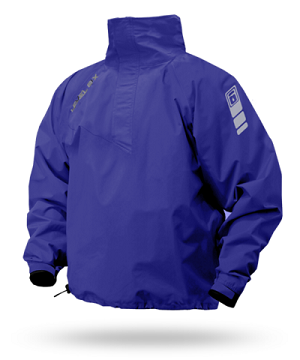 Made of durable Entrant 2-layer waterproof/breathable fabric. Neoprene/drawstring outer waist tunnel and Nylon/drawstring inner waist tunnel allow a spray skirt to be layered in between, creating a water blocking baffle. Upper sleeve pocket.